Ever since the Coen brothers film came out, I am quick to tell outsiders that no one in Minnesota actually speaks with the vocabulary and accents of the characters in Fargo. Only to to my embarrassment, I am reminded from time to time that some of us do. 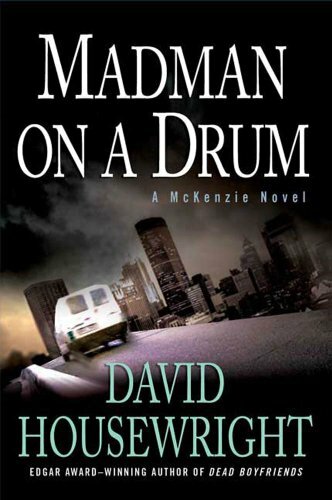 I’m plowing through David Housewright’s St. Paul-based McKenzie mystery novels. Madman On a Drum seems to me the best of the series so far. It takes a already interesting cast of characters and goes deeper with them, under the most stressful of circumstances. Wealthy, amateur detective (and former cop) Rushmore “Mac” McKenzie has no real family. He has a steady girlfriend, but she adamantly refuses to discuss marriage. The closest thing he has to a family is the Dunstons, the family of his childhood best friend Bobby, also a cop. Mac is constantly at their house and spoils the two daughters, Victoria and Katie, shamelessly. He’s made them his heirs. So it’s not just another case to him when Victoria is kidnapped, in broad daylight. The kidnappers, by phone, demand a million dollars in ransom. It’s obvious where they expect it to come from – it will have to come from Mac. Mac doesn’t mind that. He’d give everything he has for Victoria. But he and Bobby both understand what must follow. The kidnappers must be found, and they must die. They quickly identify the voice on the phone as that of an old childhood friend, a neighborhood guy who took the wrong road in life. But finding him and getting Tori back is only the beginning. There’s someone behind him – someone with a passionate hatred for Mac, someone who plans to make Mac pay for his own murder. The dynamics of a family group faced with the kidnapping of a child are described with what looks to me like great sensitivity and insight in Madman On a Drum. There’s also a lot of discussion of our current prison system (it doesn’t come out very well). I liked Madman On a Drum a lot. Hard to put down. Recommended, with the customary cautions for language and subject matter.